← Sermon — Pr. Tony Sikora — Seriously Folks, Christ is Risen! 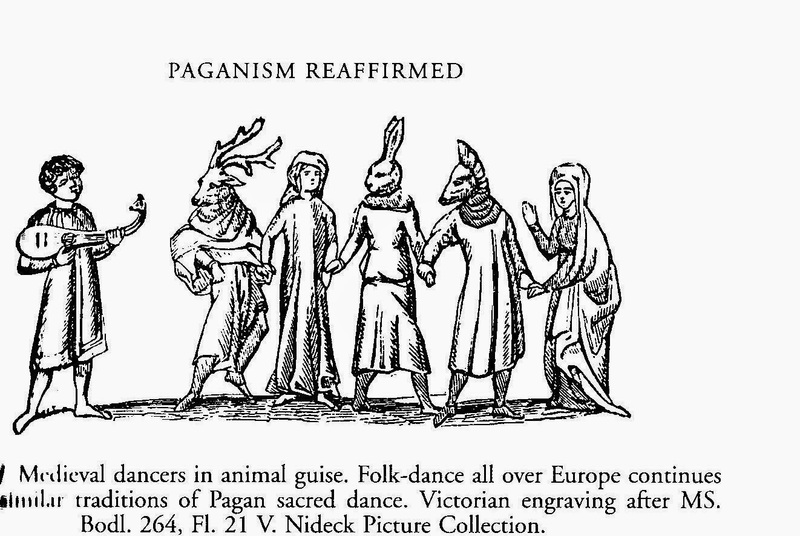 The drawing is from Prudence Jones and Nigel Pennick‘s 1995/7 A History of Pagan Europe, a Neopagan revisionist history and polemic against Christianity. In Jones’ and Pennick’s book the image is used as an example to prove that pagan rituals survived even though they were repressed by the church. The image is used in the context of equating Christianity with Nazism in the way it persecuted ancient pagans. Prudence Jones is the pen name of Lenora James, co-founder of the Pagan Anti-Defamation League along with Pennick in 1985. Bodleian Library Manuscript Bodl. 264 folio 21 verso. An illustration from 1344 by Flanders artist Jehan De Grise in collection of mediaeval romances about Alexander the Great. The original context is at the foot of the page. The Manuscript is available in digital form at the Oxford University and the page may be viewed following this link. Oxford’s licensing prohibits the re-display of the images. They may only be viewed from the Oxford web server. Throughout this manuscript the margins are filled with creatively bizzarre and exotic animal and animal/human figures which the tale implies Alexander encountered in his conquests in the east. On this particular page there are three gilded scene illustrations layered above this marginal illustration. The upper level has Alexander and his forces preparing to meet the enemy and the beasts of the enemy. The second layer has the battle. The third layer has the conclusion of the battle. The margin below has what looks to be the Virgin and baby Jesus on the left facing right toward a bird cage from which birds are being released. Toward the middle are two women who may be receiving their husbands back from battle. At the right is the scene depicted in the drawing. Only, the drawing in the book by Jones and Pennick also lacks the Priest with hyssop at the far right looking left over the dancers. The text above the margin drawing describes the scenes from Alexander’s story in the three layered drawings. 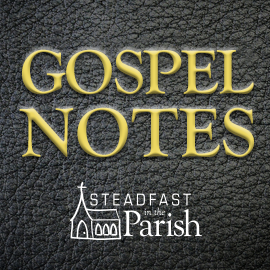 Pastor Joseph Abrahamson serves Faith Ev. Lutheran Church, Clara City, Minnesota (E.L.S.). He and his wife, Mary, have 10 children. 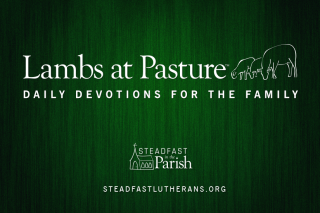 Pastor Abrahamson is a graduate of Bethany Lutheran Theological Seminary, and of the University of Wisconsin-Madison's Department of Hebrew and Semitic Studies. He has served on the Faculty/Staff at Bethany Lutheran College teaching Religion, Linguistics, Archaeology, and Self-Defense; and was on Staff at the University of Wisconsin as an Information Processing Consultant (Computer Geek) while doing graduate work in Semitics. Pastor Abrahamson served Clearwater Lutheran Parish (ELS) from 2001 to April 2015. Any idea why the costumed dancers are on this page and what it would mean to include the priest with the hyssop? Is there a secondary theme in the illustrations of this manuscript? Kimberly Woolery made a study of this MS and lists current interpretations of the marginal drawings, many demonstrated as relating to the text. Previously it had been thought that the marginalia were a Punch and Judy show of mediaeval life. See references and bibliography there. The guised dancers are often called mummers. And though guised dances are sometimes featured in MS from the 14th c and later, the earliest documentation of a mummer’s play comes from the 18th c. That’s not to say the earlier couldn’t have been, it’s to say that we can’t know that they were mummers. H. Jensen on Is the LCMS Becoming a Feminist Synod? Inspirationally revitalize interractive best practices.